At Kriskadecor we are so exicited!. We have launched our new brand identity developed by Nomon Design Barcelona. This new image shows the change that our brand is going through: new possibilities to use our essence, our small anodized aluminium link, in design projects for architects and interior designers. 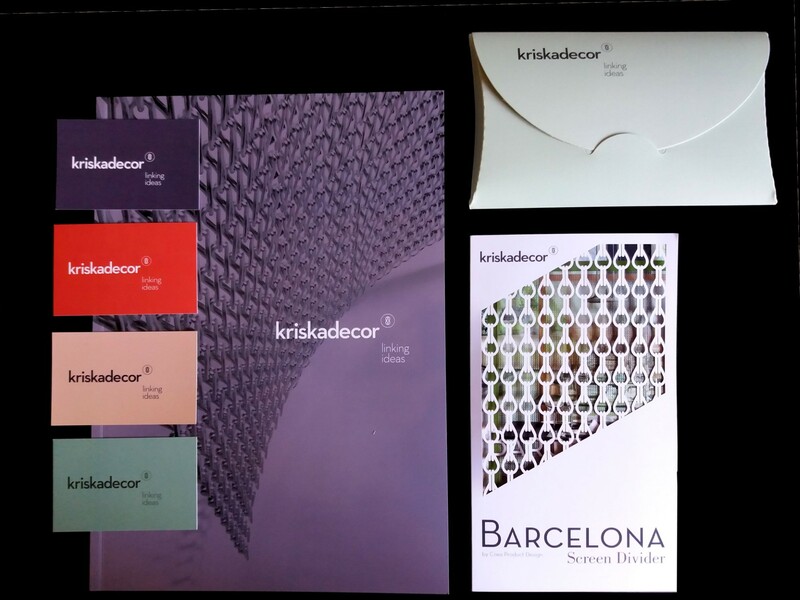 The new logo is a refreshing change that helps to position Kriskadecor as a design brand. The presence of the mesh becomes an inspirational element through a new symbol that emerges from the superimposition of two small metal links, which are intertwined symbolizing an infinite union. The logo transmits precision and rhythm through a geometric typography with balanced forms. The new symbol and also the baseline are placed in an unsual position. This brings originality to the whole set. Linking ideas is the new Kriskadecor’s baseline which plays with both literal and figurative meanings of the actions of physically use the links and also the poetical meaning of making ideas come true.